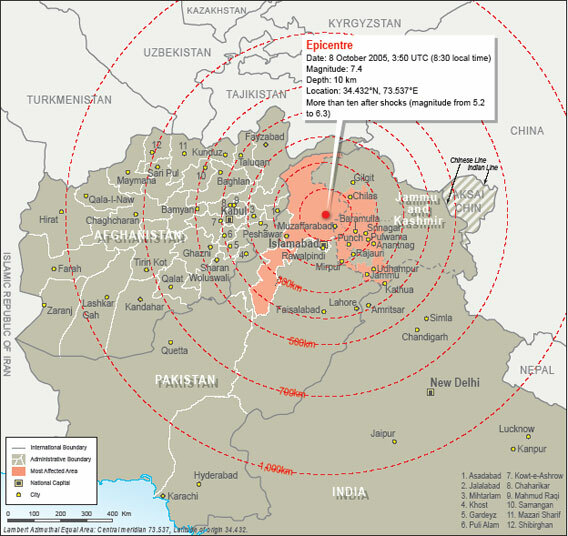 On 08 October 2005, at about 0852 hours, every individual and each entity was damaged by a catastrophic earthquake in the most parts of Azad Kashmir and few areas of NWFP in Pakistan. For a few moments, the life was still. A few villages in the mountainous region in upper Azad Kashmir disappeared within seconds. The life became a dream for those who survived after the calamity. It was a big challenge for humanity. Within a few hours after the earthquake, workers of the PFP started humanitarian work at individual level. Initially they focused on rescue, first aid, searching strangled individuals under the debris and providing shelter, recovery of wounded persons and dead bodies. When everyone was in the condition of shock, Press for Peace started working upon extreme emergency basis. With a small setup and no assets, its volunteers were determined to put the best of the efforts. To set an example, the Chief Coordinator PFP handed over all his belongings to the affected people who were in the dire need of relief goods. During the recurring jolts, when everyone was worried about his own and his relatives’ safety, Zafar Iqbal, the founder of Press for Peace(PFP) went after the screams of severely wounded school children and recovered a large number of them to the first aid units. He was mad to pursue the cries of strangled and dying children. To follow his example, each member of the Press for Peace devoted himself for emergency relief work. For first two days journalists and reporters in Azad Kashmir engaged themselves to the much needed rescue work. During that period, what was reported on national and international media, it was based on rumors and personal accounts of some of the victims in lesser-affected areas. In fact, the actual scene of destruction was not being reported in a professional manner. At this critical time, Press for Peace felt its responsibilities. It observed that the best possible humanitarian work at the time was to inform the world about devastation of the earthquake. The chief coordinator called an emergency meeting of the executive council. Amir-u-din Mughal, Tariq Naqash, Mohammad Fareed-ul-hadam, Wseem Khan, Asif Raza Mir, Najam-ul-Islam Assri, Aurangzeb Saifullah, Daniyal Shahab and others attended the meeting. Though, every member of PFP was shattered at the occasion, they managed to gather at the debris of a building with there wounded hearts and souls. A few have wounds on their bodies too. Their houses were destroyed and family members killed. After the earthquake, everyone present at the first emergency meeting of Press for Peace decided to resume professional responsibilities with a renewed pledge to serve the ailing humanity and put the best of their efforts to save the dying human beings. It was decided to immediately contact, by any means, with electronic and print media in major cities of Pakistan. The members started contacting the media persons and media houses via a few private telephone lines still lying intact. Press for Peace observed at the occasion that unfortunately, the professional journalistic sources were totally damaged by the earthquake. The chief co-coordinator managed to meet the emergency need of cameras, films and telephone sets by self-help basis through personal contacts. It was found that most of the communication links with external world were non-existent and unavailable. Press for Peace realized that first two days media reports focused only the Margalla towers in Islamabad. It meant the world was unaware of the much higher destruction in the upper mountainous regions of Northern Pakistan. During the earthquake, Amir-u-din Mughal then Coordinator FPP who was also working for international news agency Reuters as a photojournalist got serious injuries. But he resumed his professional activities within a few days. His images of the destruction in affected areas drew international attention and subsequently, a multitude of national and international donor agencies started arriving there. When these NGOs, government representatives and individual philanthropists reached in Muzaffarabad, they wanted to gain information and access to the worst hit areas. The members of PFP voluntarily offered their services to assist those individuals and organizations. The members of PFP made rigorous efforts to send photographs and films of the havoc via army helicopters. Due to non-availability of electricity, the fax service, a major tool of the reporting team was non-existent. The journalists of Press for Peace used private contacts to convey the details of tragic account the death and destruction to the media houses. Within a few days, Press for Peace was the most active media entity in Muzaffarabad to guide national and international media. Later on, many established and worldly recognized media organizations acknowledged the services of Press for Peace. On 11 October 2005, an extra-ordinary meeting of the executive council of Press for Peace held in Muzaffarabad. The council realized that due to non-availability of coordinated media efforts, most of the NGOs and humanitarian organizations were facing hurdles to reach to the affected areas. Therefore, in order to guide and assist a large number of the members of incoming welfare bodies, the council decided to establish Press for Peace Volunteer Force. Headed by a youth leader, Zulfiqar Beg, the volunteers did a marvelous job. The PFP acknowledges and appreciates the services of volunteers Malik Zulfiqar, Danial Shahab, Wafaq Anjum, Fazil Mughal, Ejaz Kazmi, Zubair-u-din Arifi, Saeed-ur-Rehman Sajjad, Tassadaq Hashmi, Waqar Hashmi and many others from the university, schools and colleges. The PFPVF’s efforts were a guiding source and inspiration for those who remained in the state of shock and helplessness for the first few days. Resultantly, a large number of people from every walk of life volunteered themselves for relief work. Press for Peace assigned them tasks according to their skills and capabilities. In order to guide and assist foreign NGOs, journalists and survey teams’ university and college students with good command over English were detailed as interpreters. In fact, when aid workers from different parts of the world reached Muzaffarabad, they found it difficult to ascertain the scale of relief in the remote areas of upper villages of Muzaffarabad and Neelum Valley. At this occasion Press for Peace provided them much needed guidance and awareness about these areas. Being impressed by the selfless contribution of the volunteer force, more and more people contacted to participate in humanitarian work. It was encouraging. The candle lights the candle. Within a few days, the number of volunteers raised to 250 and later on more than 500. When everyone was running after the much needed relief goods for the sake of life of his kith and kin, the members of Press for Peace devoted themselves to assist those unfortunate families where no male members were left behind. The members of Press for Peace would collect cooked food from charities and distributed it among those who were in dire need of it. The PFP with the assistance of other NGOs and relief agencies distributed 1000 plastic sheets, 500 burners, 852 quilts, 250 lamps, 500 sacks coal, 460 blankets (Korean), 950 packets of dates (1 kg each), 460 bundles of sweaters, 1150 shawls, 560 blankets (ordinary) in the affected families. More over, 22 trucks load of food items, clothes, jackets, shoes and other items of daily use were also distributed. Press for Peace took care of the ego of the affected people during relief work and humanitarian activities. During the dark hours, volunteers and central office holders of PFP carried the relief goods on their shoulders and distributed in the widows, hawkers, journalists and members of district administration. Before earthquake, they all were well to do citizens, but now they have nothing except clothes on their bodies. Each member of Press for Peace voluntarily distributed the relief goods without any hidden motive of publicity or fame. The PFP is an organization of selfless devotees and zealous enthusiasts who share the common goal of reducing human miseries. Press for Peace established a media city in Chehla Bandi on emergency basis to facilitate media persons. Hotels and restaurants were not available due to the massive destruction. Former Chief Coordinator Press for Peace provided land to establish the Media City. This facility remained functional for 7 months and offered professional facilities to media persons. Suitable arrangements of daily meals and lodging were made the Press for Peace Media City. In District Bagh, Press for Peace team comprising of Yousaf Kashmiri, Dr. Hafeez, Tahir Shah, Imran Gillani, Shoukat Taimoor, Miss Obaida, Miss Salma and others started humanitarian work on self help basis. The PFP distributed tents, blankets, and gas cylinders, lamps and ration for the journalists of Bagh. The organization also established a free medical camp in Bagh.In District Mirpur, the slightly affected area, the coordinators of Press for Peace continued their efforts on journalistic front. The Education sector in Azad Kashmir was the most affected government department .The number of destroyed school/college buildings was alarming. In fact, the buildings made under government contracts proved more devastating than the earthquake itself. In many cases, the whole structure was collapsed within seconds. Due to poor standards of constructions, a whole generation went under debris. All those students who survived were traumatized and refused to resume their educational activities in the destroyed school buildings. This was a natural outcome of the earthquake. The executive council of PFP decided to establish tent schools on emergency basis. Press for Peace members encouraged parents to send their children to schools in order to resume normal education activities. Initially, sheltered accommodation being the major concern of the donor agencies the tents was not available for schooling purpose. The PFP started primary classes in the courtyard of the ruined building of daily Khabrain. The first PFP tent school; established upon the rubble and under the sky, was a ray of hope for many who had lost everything in the earthquake. The office bearers of Press for Peace volunteered themselves to teach the students and went door to door to motivate the parents. Later on highly educated members of the PFPVF were appointed as teachers. Mrs. Zahida Zahir Jagwal volunteered herself to look after the matters of this school. Press for Peace highly appreciates the services of volunteers Waseem Khan Jadoon, Miss Farzana, Khaliquue-ur-Rehman, Sudhir Ahmad, Israr-ur-Haq Gillani and many others. They all devoted themselves for the resumption of normal educational activities in the quake-hit areas. Due to growing interest of the people Press for Peace decided to establish more tent schools in the remote villages of Muzaffarabad region. Miss Sumera in Lower Platte, Miss Nighat in Chehla Bandi, Miss Amna Luci in Ambore, Miss Nishat Mughal in Punjgran, Asif Mir in Neelum Valley and Jalal-ud-din in Kundal Shahi were appointed as the resource persons and in charge of the PFP tent schools. An eminent educationist and the Chairperson of PFP Women Wing, Madam Tanvir Latif supervised these schools. We applaud the contribution of teachers and volunteers who offered their services to bring success to this project. 32 teachers of PFP Educational Unit taught one thousand school children for more than six months without getting and stipend or salary. The educational setup in quake hit areas was totally collapsed. The PFP educational unit started especially prepared testing service to assess the progress made by the students after earthquake. All those students who appeared for tests were declared successful. Press for Peace also managed to acquire regular stipends for needy students. In order to impart moral and religious education, a religious school was established near Chehla Bandi in Muzaffarabad. Press for Peace started shelter program at the remote village of Punjgran, where the life had become impossible in tents due to heavy snowfall. The volunteers of PFP headed by Asif Raza Mir carried out an arduous task of surveying the area and prepared a list of those who were in urgent need of shelter. Later on the information gathered was conveyed to a sister NGO of Lahore with a request to save the survivors of earthquake from dying of cold. Shirkat Gah responded wholeheartedly to the request of the PFP. The NGO provided sheets and other building material to accommodate 800 families of villages Devalian, Chamba, Tatrial and Punjgran. Ahmad Raza Khan of Shirkat Gaah, Asif Raza Mir, Ali Gohar, Asad Ali and many other volunteers from Press for Peace worked day and night to complete this program. The people in the area were already underprivileged and after earthquake were badly in need of the relief goods. Press for Peace also distributed cooking utensils, ration, burners, warm clothing and shoes.